It’s not often that you put the word “interesting” and “door” in the same sentence. Most would consider for good reason too, as most of today’s doors are designed to fit tightening budgets and more and more frequently conform to regulations. Today’s average door customer is also to blame; going to shops with a pre-conceived idea of the door they should be looking for& assuming that a new door should simply partition an area and provide additional security when needed. Some designers however have different ideas of what a door should be; below we have highlighted what we consider to be the five most interesting door designs & ideas we have come across. They certainly helped shift our perception of doors and hopefully might inspire you too. I know what you are thinking… “why didn’t someone think of this before?” and to be honest I just don’t know. 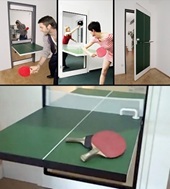 Adding a central rotating hinge to a door and converting it to a table tennis table is such a great use of space. Admittedly things become a little complicated if anyone wants to get past, but that shouldn’t take anything away from this fun and functional idea. Designed in the UK by ‘Slam’, this door is great on so many levels, literally. Firstly being split into three doors gives it a slight fantasy feel and makes you wonder what actually is on the other side. 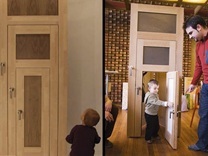 Secondly for children or those of a slightly shorted frame this door is wonderfully functional, allowing easy access to the room below. Not so much a door as a ‘door accessory’ but we simply couldn’t put together this article about interesting doors without bringing to your attention this great door knob. Not one for the freight hearted, but it will definitely get people talking and might even do the introductions for you. So you have already committed the cardinal sin and purchased a ‘standard’ door; don’t worry there is still a chance thanks to Trompe L’oeil of rectifying things. Trompe L’Oeil design and manufacture interior door covers which transform your ordinary door into a portal to somewhere else. 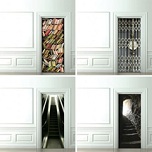 From hidden bookshelves to castle turrets, these covers cannot fail to make any door a little more interesting. The core function of most doors is to provide a physical barrier between one space and another. Conventionally that means blocking out light and to a certain extent preventing the circulation of air. That was until the ‘Luna’ door was designed, this revolutionary door allows you to manually select how much light and air passes through it. These ideas and tips have been brought to you in association with Yale Composite Doors UK. Yale composite doors are available in a range of styles from Contemporary to Edwardian. Yale’s front doors UK also adhere to the strictest security and environmental standards. 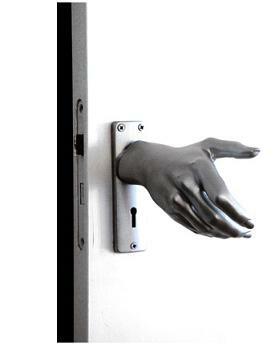 If you’ve ever felt like getting in touch with your surroundings, then this “hand door knob” is for you. Made of polished solid aluminium, the handle won’t be letting you pass through the door without a helping hand. 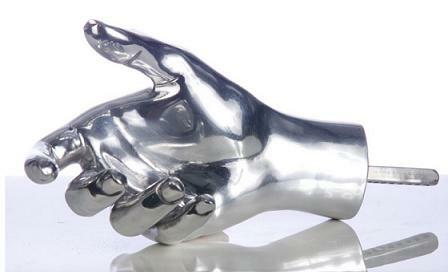 Named “Hand-Le”, the interesting human hand door knob was created by the Dutch product designer Naomi Thellier de Poncheville for the London Design Festival. As visitors to the festival exclaimed upon seeing the “Hand-Le”: “We thought the Dutch to be very friendly people but this is taking the welcoming handshake a little too far”. The hand door knob needs a good shake or twist when moving from room to room, so it’s probably not suitable for a granny flat. Would you like a door handle like this?